The best (hoped for, but truly unexpected) news for me was that javakeda won the race. Ker 40s took the first two positions, while kenza sailed his Class 40 to third place. First of all javakeda made no major mistakes during the race. Put another way, diligence is a prerequisite for a podium finish. Don’t know about the rest of the skippers, but for me, a mistake-free race is fairly rare treasure. Second, in the race, javakeda was a Ker 40 — the fastest of the three boats according to pre-race routing. That doesn’t guarantee line honors for a Ker 40, but it does improve the odds. Third, every WX after 23 JAN 1030Z helped javakeda. Even the missing 23 JAN 1630Z WX helped because javakeda was on an off-shore swing that depended on the 1030Z forecast holding up. 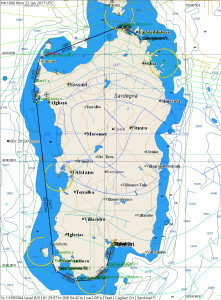 – the 24 JAN 0430Z WX forecast increased TWSs, and that restored the polar advantage of javakeda’s Ker 40 over outlaw’s (very well sailed) SOTO 40. 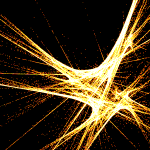 – The 24 JAN 1030Z WX had the fleet sailing into increasing winds. 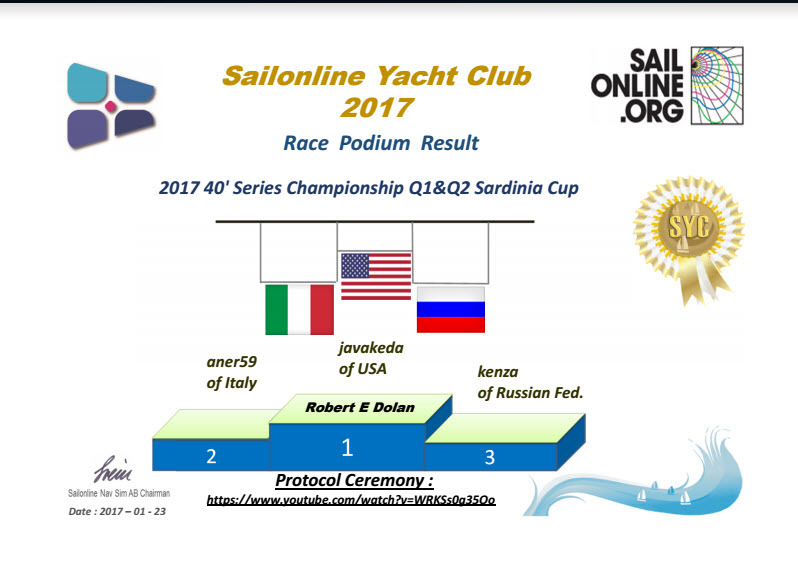 That condition benefits the lead boats, and allowed javakeda to extend a narrow (0.2nm) lead rounding Capo del Falcone to just under 1 nm at the finish. Fourth, most of the SYC top ten skippers chose to sail the “slower” Class 40. 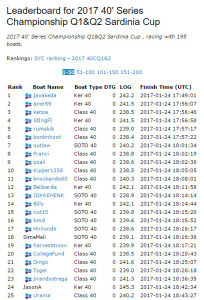 Only Alexandria and longreacher from the top ten were sailing Ker 40s, and each of them had a mishap that took them out of contention. And Finally, sleep management is a must in these races. The Sardinia race started at 0200 Monday for skippers on the USA Pacific Coast. It finished (for javakeda) at 0949 Tuesday morning. Day naps were essential. But extremely important was validating DCs set for early Monday morning that included two open water gybes. I used Kipper’s DC Checking software to validate. It let me sleep in peace. Results validate the choice of the Class 40 by most top ten skippers. 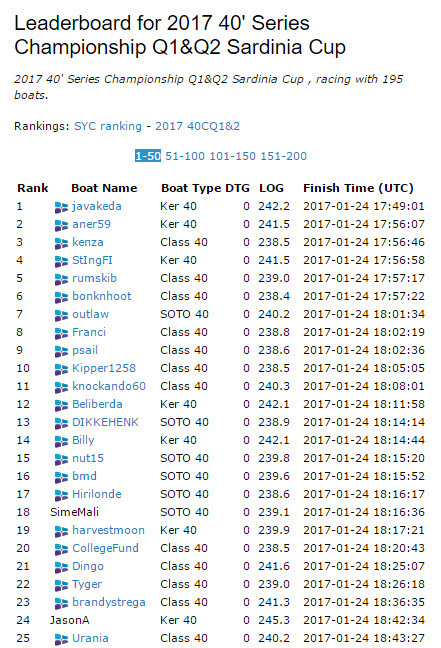 As outlaw said in chat early in the race, the key to this series is performing well in the slower boats. He certainly lived up to that standard with his 7th place finish in a SOTO 40. Moreover, as a group, the skippers who chose the Class 40 performed better than expected based on ‘random wind’ pre-race routings. Next up is the New Hebrides race. The results of this race provide data for gaming strategies in boat selection. That looks like a fitting subject for another post.